There are a variety of venues to choose from, each equipped with professional staff that will ensure your wedding is perfectly planned. The rich local culture also opens up the opportunity for couples to have unique experiences such as a Buddhist praying ceremony or a holy water pouring and bonding ceremony. Located just off the coast of Australia, Hayman Island offers everything you would expect in a tropical beach wedding: beautiful blue skies, crystal clear waters and an unforgettable view of the Great Barrier Reef. Opting for a hotel to organize your venue will ensure a world class setup with all the amenities. If you’re looking for a luxury experience with every tropical treat that you can imagine, Bali is the place for you. Infinity edge swimming pools, serene spa treatments, delicious food, penthouse suites and rooftop lounges come as standard here. There are plenty of resorts to choose from. AnantaraSeminyak Resort is one of the more popular spots for couples having a wedding in Bali. With just under 60 luxury suites, private balconies and divine jacuzzis, this resort has everything you can imagine and then some. While it won’t come cheap, it’s an ideal option for couples who want the most luxurious experience. For those living stateside, Mexico is a much more convenient option that’ll help you save on flights and transporting the rest of the family. However, that’s not to say Riviera Maya won’t provide everything you desire in a romantic beach wedding. Five-star hotels surrounded by azure waters and meticulously maintained beaches are commonplace here. Couples can choose from a number of luxury services, including a great selection of wines, cuisine and decoration. You can also enjoy the local music with a live band performance and end the day with a relaxing spa treatment. 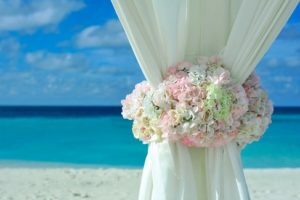 We believe that the above locations will provide the absolute best beach wedding experience money can buy. Other noteworthy spots include Hawaii, Fiji, the Caribbean and the British Virgin Islands. If you’re having trouble deciding, perhaps it’s time to speak to your significant other and find out what they like.